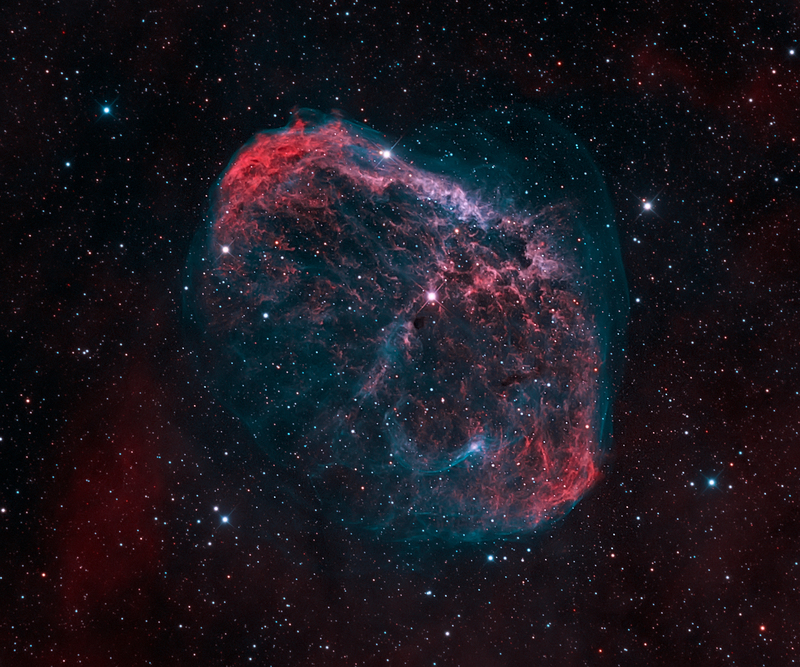 Explanation: NGC 6888, also known as the Crescent Nebula, is a cosmic bubble about 25 light-years across, blown by winds from its central, bright, massive star. This sharp telescopic portrait uses narrow band image data that isolates light from hydrogen and oxygen atoms in the wind-blown nebula. The oxygen atoms produce the blue-green hue that seems to enshroud the detailed folds and filaments. Visible within the nebula, NGC 6888's central star is classified as a Wolf-Rayet star (WR 136). The star is shedding its outer envelope in a strong stellar wind, ejecting the equivalent of the Sun's mass every 10,000 years. The nebula's complex structures are likely the result of this strong wind interacting with material ejected in an earlier phase. Burning fuel at a prodigious rate and near the end of its stellar life this star should ultimately go out with a bang in a spectacular supernova explosion. Found in the nebula rich constellation Cygnus, NGC 6888 is about 5,000 light-years away.